Last week the State Department announced a $200 million cut in annual aid to the Palestinian Authority. Before that, America cut support to UNRWA, a body created in 1949 to tend to some 750,000 Arab refugees from the war Israel's neighbors launched to erase it off the map. UNRWA now handles aid to over 5 million Palestinians, while another UN agency deals with refugees everywhere else on the globe. Absurdly, Palestinian UNRWA clients living where the Palestinian Authority or Hamas has full control remain "refugees," despite Palestinian rule. Former Knesset member Einat Wilf, a vocal advocate of peace negotiations with the Palestinians, nevertheless calls for dismantling UNRWA. "UNRWA encourages radicalism. It keeps alive the dream that the pre-1948 status quo will return and that Israel as a Jewish state will be erased from the map. I'm not against aid to Palestinians, just against encouraging that dream," she said. In the long run, peacemaking will succeed if it addresses 21st-century facts, rather than 1948 hopes. President Mahmoud Abbas reminded us once again last Saturday why he and his Palestinian demi-government may need be sidelined for sake of peace in the region. Because he and the so-called Palestinian “Authority” in the West Bank are corrupt, ossified and obstructionist in every way. At a meeting of the PLO Central Council, Abbas called on Palestinians to “keep the ground aflame with popular resistance” against Israel – code words for violence, if not terrorism. Abbas’ main foreign policy deputy, PLO Secretary-General Saeb Erekat, went on to lead the Council in declaring support for “heroic” Hamas-led attacks against Israeli troops and civilians across the Gaza border, while condemning Hamas for negotiating a truce with Israel. The resolution also savaged the Trump administration for seeking to “destroy the Palestinian national project” and of course called to ratchet-up BDS campaigns against Israel. Abbas’ actions appear driven by his marginalization, with Israel and the Trump administration Mideast team clearly planning to bypass the PA altogether in favor of a plan to enhance security and economic prospects in the Gaza Strip. This marginalization is in turn driven by Abbas’ self-inflicted wounds; sourced in the fecklessness and growing radicalization of Abbas and his aging coterie. Remember: Abbas has fled from real negotiation and compromise with Israel at every opportunity over the past 15 years. He has espoused maximalist positions, stoked hatred of Israelis and Jews, inculcated a culture that denies Jewish history and national identity, venerated terrorists, and pushed the criminalization of Israel internationally. He has driven most Israelis to the realization, alas, that there is no reasonable peace deal with the Palestinians to be had at this time. "This is the conclusion of a process over the last two year: In December of 2016 I had the opportunity to meet with president-elect Trump's adviser, who was about to come to Washington. She was here in Jerusalem, and I showed her the [UNRWA] schoolbooks," he said. "She told me who she was working for, and she asked if she could have all of the books. I gave the books to her, and for the last two years, our office, the Center for Near East Policy Research, has been in touch with the administration at the highest levels, giving them everything we could about the schoolbooks. He said that the center's most recent report showed that "the right of return through the armed struggle become the most important and dominant theme of Palestinian Authority and UNRWA education." "This got directly to the president of the United States, and he blew his stack, because he was told by the Peres Center for Peace ... that the Palestinian Authority has a peace curriculum. They just didn;t tell them that the Palestinian Authority and UNRWA had vetoed that peace curriculum. He showed how a fifth grade textbook instructed students to model their lives after Dalal Mughrabi, one of the terrorists who carried out the Coastal Road Massacre in 1978, when 38 Israelis were murdered by terrorists. According to Bedein, COGAT, the Coordinator for Government Activities in the Territories, is what is preventing reform of UNRWA. "They need feedback that an education system which teaches children to murder Jews is not appropriate for a peace process." PMW: The PA: Trump is Shylock! Criticizing Hamas' recent willingness to agree to a ceasefire with Israel in return for humanitarian and economic aid, an editorial in the official PA daily warned that such relief would only be "loans" like the ones in Shakespeare's play The Merchant of Venice - in other words, loans with outrageous conditions. The editorial stated that US President Trump is Shylock of the play and that Israel "will not give Hamas gifts and... not give it anything for free." This is the kind of information that most people simply don’t know and those that do, are too dishonest to discuss it. It is important for you to read and then share it out. It’s time to reclaim the narrative for the sake of truth! Jordan is a State that was created in 1946 (two years before Israel). The area was known as Trans-Jordan (the other side of the Jordan River) and was 70%+ of what was British Mandated Palestine. The Hashemite clan came in from Mecca and occupied the area of Trans-Jordan. Although the area of Trans-Jordan was already promised to the Jews by Sir Balfour as part of the Jewish homeland, no one said a word about the illegal occupation by the Hashemite clan. The Hashemites have no historical, national or religious ties to the land they are currently occupying. In 1946 the League of Nations accepted the illegal occupation by the Hashemites and recognized a new State called Jordan which was declared on 70% of what was British Mandated Palestine. Israel became a member of the UN in May 1949 while Jordan was only recognized in the UN on December 14, 1955! 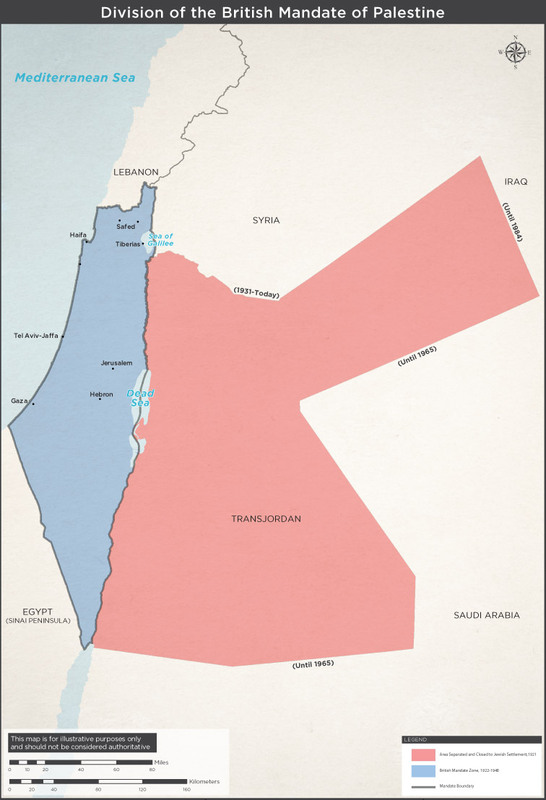 In November 1947 the UN passed resolution 181, which is also known as the partition plan. One Jewish country and one Arab country on what was at the time the British Mandate of Palestine. As a Jew who was already robbed of 70% of the Land of Israel, I find the name partition offensive. My indigenous land was already partitioned and there already was an Arab country on 77% of what was British Palestine. The Israeli hasbara apparatus with its different branches should be very much encouraged by the Al-Araby al-Jadid article, which indicates that it is moving in the right direction. That does not mean complacency is called for. 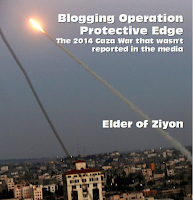 The Palestinian propaganda effort has not failed completely; it has succeeded to give Israel a bad name in the world. Israel, however, has fought back intensively and managed to expose the many lies in the Palestinian narrative. The main thing worrying Hamas is that the Western world no longer buys its message that the March of Return is a march of peace by innocent civilians. 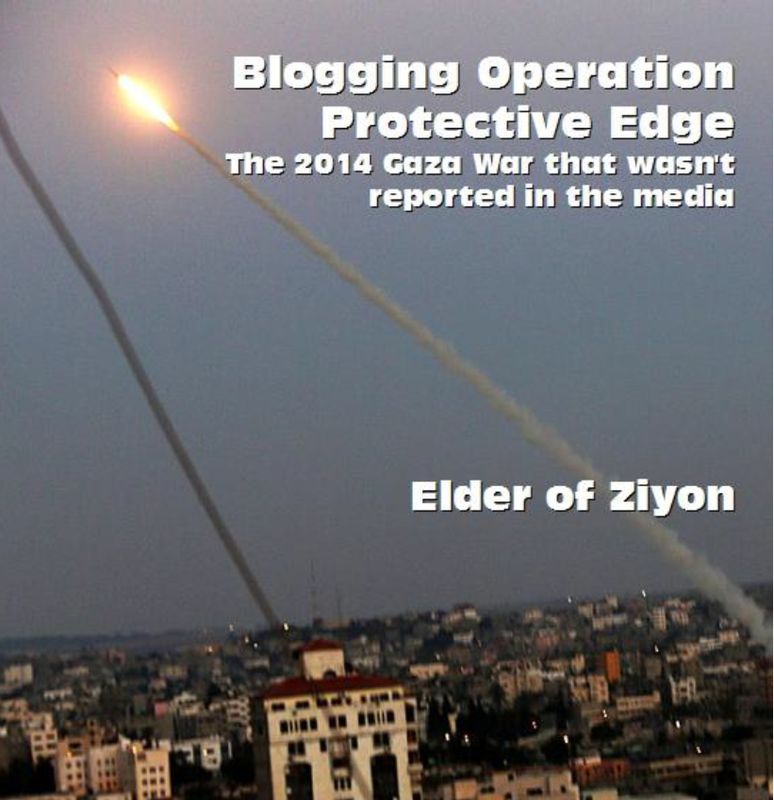 Israeli efforts have succeeded to expose this lie and has been helped in doing so by the many mistakes Hamas made. When it comes to hasbara and bringing the Israeli narrative to the Western countries, the main lesson Israel should draw is to increase its use of the social networks with videos, images, and interviews in all the languages, especially those foreign languages that are an Achilles’ heel for the Palestinian propaganda effort. The political echelon, for its part, needs to boost the Israeli hasbara apparatus as a whole by giving it the budgets it needs. It has proved that it can get good results. The argument presented by the former president hinges on something he must know will not happen: “the Syrian government must accept the inevitability of reforms and implement confidence-building measures, including the release of detainees and accountability for their treatment.” Asking the Assad regime to reform and build confidence is like counseling a shark to go vegan. And accountability for the torture chambers and the mass murder conducted therein would require Assad and his jailers to present themselves for trial in The Hague. Clearly this will not happen. . . . Indeed, the essay’s author does not even require the release of detainees and accountability as first steps. . . . There is a school of thought in the American intelligence community that an embassy in Damascus might have enabled cooperation with the Assad regime against Islamic State. Yet Assad’s policy from the beginning of the uprising has been to promote extremist reactions to his misrule in order to dilute and discredit the opposition to him. . . .
[Moreover], who will require that . . . the violently corrupt Assad clan and its entourage will enact reforms, even measures watered-down in advance by a credulous, crawling West? Does one truly expect those who have waged a war of mass homicide against civilians over the past seven-plus years will shift into a reformist mode so that embassies can reopen? . . .
Should Gaza Be the Palestinian State? Proponents of a two-state solution foresee a future Palestinian state in most of the West Bank and all of the Gaza Strip. In the Oslo Accords, Israel agreed to withdraw from Gaza first, with the expectation that if the Palestinians adhered to the deal, they would eventually gain independence in the West Bank as well. But the Palestinians chose terror over peace, and now neither side has much interest in the compromises necessary to create a Palestinian state. Hence, it may be time for a more radical approach in which Gaza is recognized as the Palestinian state, but with no plan for it to be extended to the West Bank. How could this possibly make sense for Israel, given that Gaza is controlled by Hamas, which is committed to Israel’s destruction, and has bombarded Israel with thousands of rockets since the disengagement that removed every Israeli soldier and civilian from the Strip? From a public relations, humanitarian, moral, and political standpoint, Israel has been pilloried since the disengagement because of its blockade, the “disproportionate” military response to provocations from terrorists, and the misperception that Gaza remains occupied. Israel has shown it can withstand the criticism, though it pays a price diplomatically and in terms of its public image. But what if Israel announced that it was prepared to recognize Gaza as the Palestinian state? Palestinian Authority President Mahmoud Abbas has reportedly lambasted a potential ceasefire agreement between Israel and Hamas, saying such a deal would only be reached “over my dead body” and drawing a scathing response from Hamas. “If the agreement is signed without the PA’s permission, it is illegal and constitutes treason,” Abbas said in private conversations, Channel 10 reported on Tuesday citing a senior member of Abbas’s Fatah party. “Over my dead body will there be a ceasefire and calm between both sides,” Abbas said, according to the source. Abbas was also said to be furious at Egypt, which has been brokering Israel-Hamas truce talks, for being willing to sit down with members of the terror group that rules the Gaza Strip without his presence. The Hamas terror group will continue arming itself even if a truce agreement is signed with Israel, a senior official in Gaza said Monday. Hamdan was quoted in Palestinian media as saying that the ceasefire deal currently being negotiated with the help of Cairo does not include the building of a seaport or a airport serving the Hamas-run enclave. “Everything that has been published about this so far is a lie,” he asserted. Hamdan also said Hamas was interested in a prisoner swap deal “more than previously.” He said that deal was separate from the ceasefire talks, although Israel insists no formal truce will be reached without the release of Israeli civilians and bodies of IDF soldiers believed to be held in Gaza. On August 20, 2018, Medecins Sans Frontiers (MSF – Doctors Without Borders) acknowledged that one of its nurses, Hani Majdalawi, opened fire on Israeli troops stationed along the Gaza border. MSF stated, “MSF is working to verify and understand the circumstances regarding this extremely serious incident, and is not able to comment further at this stage.” Operating as a combatant while posing under the cover of the legal protection for medical workers is a serious violation of international humanitarian law and the Geneva Conventions. It is also a grave abuse of humanitarian principles under which MSF is bound. In addition to working at MSF, Hani Majdalawi’s Facebook profile lists that he previously worked at Oxfam Great Britain, American Friends Service Committee, and the Youth Empowerment Center – Palestine. This incident comes at a time when MSF has increased its politicized activity regarding Israel. In the months prior, MSF accused Israel of serious crimes and human rights abuses regarding the violence along the Israel-Gaza border. Careful analysis of these reports reveals that MSF uses emotive narratives in place of factual information about medical injuries and treatment. Martin Peretz, former editor of The New Republic for 35 years, has an opinion concerning Israel's newest legislation brouhaha, the Nation State Law, and he published it in the New York Times. To his thinking, the "West Bank Model Is a Failure And Israel’s new nation-state law will import those failures into Israel itself". a state whose symbols are Jewish; whose holidays and calendar come from the Jewish tradition; whose gates are always open to any Jew seeking refuge or a new home; whose government is accountable to an elected parliament; whose administration operates within the bounds of law; whose free market grows and brings in more people from more diverse backgrounds to participate in its activities; and whose people are entitled to the minimum civil and legal protections of a modern free society regardless of their religion or ethnicity. says that “development of Jewish settlement” is a “national value” — settlement including in the West Bank. Aliaa speaks with disdain about the Palestinian poster child Ahed Tamimi and her "narrative of courage." Tamimi received broad media coverage locally and around the world after hitting an Israeli soldier and being jailed in Israel for eight months. She described her stint in jail as being like a vacation. Aliaa cannot understand how Tamimi received so much attention when, on the same day, thousands of Syrians were tortured and murdered and the world just ignored them. "Here, the Israeli authorities warn terrorists to leave their homes before demolishing them," she says. "In Syria, they bomb the house with the residents still inside. Here, you release terrorists from jail in exchange for the bodies of Israeli soldiers, and this proves how much value human life has to Jews and how little value it has to Arabs." Aliaa also speaks of the "Palestinians, who incited and subverted against the leadership and the citizens of every country that hosted them. They did it in Lebanon, in Jordan, in Kuwait, in Tunisia and in Syria. The Palestinians always betrayed their hosts. Therefore, as a refugee, I think they need to return to their homes in Israel. That is the right of every refugee. 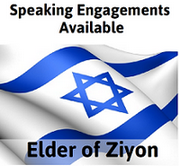 In Israel it will be different." Her conclusion does not inspire confidence. She knows that if the Palestinian refugees return to Israel, it will mean the end of the Jews. After speaking with her, I could only conclude: The Golan will not be returned, and no Palestinian refugee will return. That night, as I left the narrow streets of Lakiya, I saw the mounds of trash and felt the sand that had crept in through my windows into my nostrils and eyes. I feel warmth and affection toward my Bedouin hosts and an urgent desire to advance their interests. That is the real message of my visit to the Negev. Dozens of firefighters evacuated a part of the building housing the French parliament on Monday following the mailing there of a letter containing slurs against a Jewish lawmaker and white powder. The letter, reading “fat Zionist pig, you’re not French,” among other insults, was opened by an employee of Meyer Habib’s office Monday, the lawmaker wrote on Twitter, leading to the evacuation over the white powder. At least 40 firefighters and 20 police officers were dispatched to the seat of the National Assembly, the French parliament’s lower house, in Paris. They evacuated the building and scanned it. The powder was found to be harmless and the threat lifted from parliament within an hour of the evacuation. Police were looking for the culprits but have no suspects in custody. Habib, a former deputy president of the CRIF umbrella group of French Jewish communities, represents French voters based in the eastern part of the Mediterranean. A Greek anarchist group staged a protest Tuesday at Foreign Ministry building in central Athens to oppose Greek-Israeli energy and military cooperation as well as the decision by the United States to move its embassy in Israel to Jerusalem. In the videotaped protest posted online, two members of the Greek anarchist group Rubicon climbed into the ministry compound and left a bag near the entrance. The group said it contained a Palestinian flag and photographs of Palestinian protesters shot dead by Israeli forces during demonstrations that coincided with the US Embassy move in May. Greece has improved ties with Israel in recent years, and the two countries hold regular military exercises in the region, often joined by US forces. Israeli citizens living near the Gaza Strip border spoke at a townhall event hosted by the Jewish National Fund where they shared harrowing details about living in the embattled region of the world. The following is an interview with Yedidya Harush, who represents the Halutza communities and the entire Gaza Envelope region and Michal Uziyahu, who is a director of community centers in the Eshkol Region, which shares some 30 miles of border with Gaza. Q: What do you feel is missing from the news headlines that are coming out of that region? Mr. Harush: I feel like the news doesn’t talk about us at all. The people know nothing. We feel that, as far as the media goes, you only hear what happens on the other side of the border. That is very unfortunate for us. That is a big reason why we are here. We came to tell the truth of what has not been told or has been heard. Q: What do you feel has not been told? Mr. Harush: What has been going on for the past six months. It started with riots on the border where people would try to hurt our soldiers. They would also send balloon bombs over our communities. Those balloons have seriously damaged our forests and fields. Every winter, there is a big festival going on. In the festival, there are beautiful red flowers that usually sprout during the festival and they are not allowed to be picked. I always tell my daughter when I would take her not to pick those flowers. I tell her that if she wants to touch them, that is fine, but she cannot pick them. She respects the rule and follows it. Then she sees the balloon and these balloons have burned that entire nature preserve where we picnic every year. The Jewish Agency will be offering loans of up to 100,000 shekels ($28,000) to businesses in Gaza-vicinity communities that have suffered a financial blow over the past few months of rocket attacks and arson terrorism emanating from the Gaza Strip, Israel Hayom has learned. The assistance, earmarked for small and medium-sized businesses whose activity has been significantly hampered by terrorism from Gaza, is being disbursed through the Jewish Agency's Loan Funds Initiative. The money comes from a special donation by the Ness Fund, which supports the development of the Negev Desert. The Ness Fund is a project of the Jewish Federation of Greater MetroWest New Jersey and the Greater Miami Jewish Federation. The loans are designed to be provided on favorable terms and processed quickly. In related news, a three-day expo of businesses from the parts of southern Israel that border Gaza opened at Tel Aviv Port on Tuesday under the slogan "Otef BeKef" ("Fun in the Periphery"). The Beer Sheva District Court today rejected the appeal of Sheikh Sayyach Abu Amdiam (Sayyakh al Turi), the primary figure in the illegal settlement at “Al Arakib,” a Bedouin encampment situated on State-owned land near the Lehavim Junction in the Negev. Today's District Court ruling upholds the Beer Sheva Magistrate Court's decision (December 24, 2017) and lays the al Arakib tale to rest, once and for all. In addition to ten months in jail, Abu Amdiam, who was found guilty of 19 counts of trespassing, 19 counts of illegal encroachment on public property, and one count of violation of a legal directive, was sentenced to an additional 5-month suspended prison sentence and a fine of NIS 36,000. Al Arakib is an illegal Bedouin settlement that sprang up sometime around 1999, on state land some 10 kilometers north of Beer Sheva. Members of the Al Ukabi family of Rahat have seized state-owned land in this area over 100 times, each time putting up different structures and claiming the land in question has been owned by their family for generations. Among claims rejected by the court is the contention they were evacuated from the area by the IDF after the War of Independence, with the promise that the evacuation would be temporary. 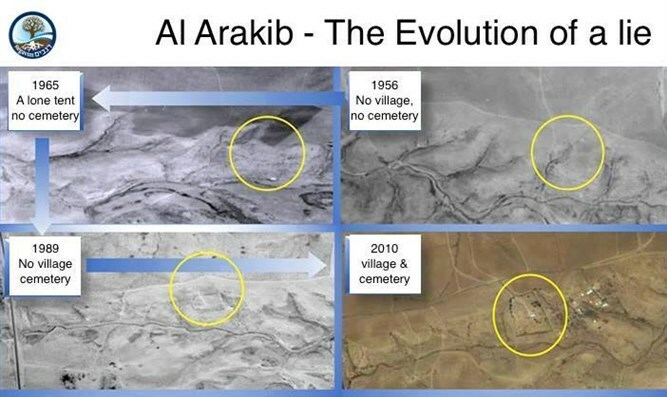 In a widely publicized vocal and often violent campaign, leftist organizations have sold the Al Arakib fiction to the international media, framing it as a symbol of the Bedouin community’s stubborn and “heroic” fight to cling to their “ancestral lands” at all costs. The Israeli military on Tuesday demolished the West Bank family home of a Palestinian terrorist who murdered an Israeli father of two a month ago and was shot dead in the attack. Footage distributed by the military showed an armored bulldozer tearing into the one-story structure in the village of Kobar, north of Ramallah. Mohammed Tareq Ibraham Dar Youssef, 17, broke into the settlement of Adam on July 26, and stabbed three people, killing Yotam Ovadia, 31. One of those wounded in the assault fatally shot the terrorist, the military said. Israel says its home demolition policy — which has been upheld by its Supreme Court — is both punitive and a deterrence to potential attackers. In a statement following the demolition, the military said dozens of Palestinians hurled rocks, firebombs and pipe bombs at troops who deployed in the village and that they responded with “riot dispersal means.” It said none of the soldiers was hurt. There were no immediate reports of any Palestinian injuries. The Shin Bet has uncovered a large-scale Hamas operation in the city of Hevron, it was cleared for publication Tuesday. The terror cell included a large number of women who maintained secret contact with the Hamas leadership in the Gaza Strip and abroad. This connection included the transfer of messages and instructions, the transfer of funds to finance terror activities, and the coordination of activity. The Shin Bet investigation revealed that the cell promoted Hamas activity in Hevron, which included the recruitment of activists, the coordination of activities in mosques, preaching activities, increasing support lines, intelligence gathering, online incitement, assistance to prisoners' families, and more. Hamas also attempted to take control of the Hevron municipality and various charities in the city. The cell was led by Nizar Shehadeh and Faras Abu Sharh - both of whom are senior and well-known Hamas terrorists who had served prison terms several times in the past for their terrorist activity. Shehadeh and Abu Sharah used a number of women who established a central committee to serve as the operational arm of Hamas' headquarters in Hevron. The United States offered to leave Syria completely in exchange for a full withdrawal of Iranian troops from the southern part of the country, the Hezbollah-affiliated news outlet Al-Akhbar reported Tuesday. According to the report, senior US and Syrian intelligence and defense officials held a secret meeting in Damascus in June to discuss the offer. Part of the American offer required a guarantee from Damascus the US would receive “a share” of Syrian oil, as well as detailed information regarding terrorist organizations operating in the war-torn country. He went on to say that President Bashar Assad had repeatedly made clear Syria’s “strong relationship” with Iran, Hezbollah and other armed groups in the region. The most senior British officer in the fight against Islamic State rejected Russian claims on Monday that Britain and the United States were about to stage a chemical attack in Syria. Maj. Gen. Felix Gedney, the deputy commander of the international military force to defeat Islamic State, dismissed as "absolutely ridiculous propaganda" suggestions that Britain and the U.S. were preparing to launch chlorine-loaded missiles, The Telegraph reported. "The U.K. is a proud coalition member with a proven track record [of defeating ISIS]," Gedney said in a tweet. "All [coalition] members condemn the use of chemical weapons." Russian Defense Ministry spokesman Maj. Gen. Igor Konashenkov said American cruise missile ships working in conjunction with "British secret services" will target the settlement of Kafr Zayta, to the south of Idlib, "as a pretext for missile strikes by the West and the United States." "Iran's continued support of the Hezbollah terrorist organization with both financial and political assistance, as well as weapons and tactical training, deserves close examination. Western diplomats and Lebanese analysts estimate that Iranian financial support for Hezbollah averages around $100 million each year, sometimes reaching amounts closer to a quarter of a billion dollars.... All of these activities pose a direct threat to U.S. security interests, contribute to the prolonging of conflicts across the Middle East, and pose threats to our key allies in the region." — US Representative Ted Budd, member of the Financial Services Committee and its Terrorism and Illicit Finance Subcommittee. Why not consider expanding the US deployment at Al-Dhafra airbase in the United Arab Emirates as a replacement for the airbases used by the US in Qatar and Turkey, if the UAE accept the idea? If one nation is able to defy or undermine U.S. policy while still pocketing the benefits of America's friendship, many others may follow Qatar's example. Why should other Arab nations endure domestic criticism, for supporting America's war on terror if they can subvert America but still enjoy America's military protection and their access to the world's largest market? Seth Frantzman: Where is the U.S.-Turkey crisis headed? The Trump administration has made Brunson the centerpiece of its policy, as opposed to discussing wider issues such as why Turkey is buying the S-400 from Russia and Turkey’s role in Syria. US media have begun to discuss whether the NATO alliance with Turkey is beneficial. “Time for Turkey and NATO to go their separate ways,” reads a piece in The Washington Post. Another piece at Foreign Policy says “Trump is the first president to get Turkey right.” The rift was already there, says The National Interest. Indeed, the rift has been growing for more than a decade since the US invasion of Iraq in 2003, when Turkey rejected a proposal to base US troops on its soil. The problem with the Trump administration’s crackdown on Turkey relations is that it could be reversed easily if the pastor is released. It could also change dramatically when Trump leaves office, as the next US administration will seek to do the opposite of everything Trump did. In US foreign policy circles, there is a vibrant pro-Turkey lobby that argues for “engagement” with Ankara, that worries that any pressure from the US will result in Turkey’s growing embrace of Iran and Russia. It sees the SDF as a temporary ally, a group that was convenient when fighting ISIS but which can be quietly abandoned in the next few years, as Washington maneuvers back to Ankara, which is seen as a 70-year ally since the start of the Cold War. These voices ignore Turkey’s own agency and independent policy. They don’t see Turkey as a full-fledged country making its own choices. They see it as only reacting to whatever the US is doing. But Turkey’s crackdown on the press and frequent outbursts in Ankara harshly slamming various European countries or the US are not just reactions; they represent a growing Turkish national wand religious consensus. Trump could make a deal, but the long-term relationship will likely remain unstable. In the wake of the free-fall of the Turkish Lira which prompted the administration to blame Israel for the economic collapse, Erdogan himself has indulged in a conspiracy theory in which he has blamed the Jews for his receding hairline.